A) earn positive profits in the long run. C) are completely unconstrained in their pricing. D) raise price and quantity over what would occur in perfect competition in order to maximize their profits. A)a single firm in which the entry of new firms is blocked. B)a small number of firms each large enough to impact the market price of its output. C)many firms each able to differentiate their product. D)many firms each too small to impact the market price of its output. D)many firms each too small to impact the market price. A) single firm in which the entry of new firms is blocked. B) small number of firms each large enough to impact the market price of its output. C) many firms each able to differentiate their products. D) many firms each too small to impact the market price of its output. 13)When ________ substitutes exist, a monopolist has ________ power to raise price. A) many firms and free entry of new firms. B) many firms and entry of new firms is blocked. C) a single firm and free entry of new firms. D) a single firm and entry of new firms is blocked. Refer to the information provided in Figure 13.1 below to answer the question that follows. 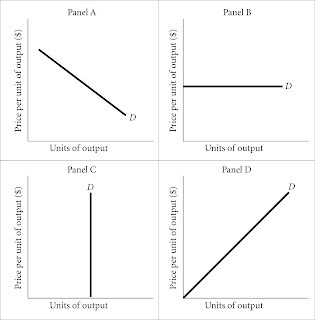 A) how much to supply in each input market. B) how much to produce. C) how to produce it. D) what price to charge for their output. 1) The music production industry is an example of a(n) ________ industry. 2)Of the four oligopolistic markets below, in which is there considerable price competition? B)on many dimensions except for price. C)on price, R&D, and marketing and advertising. 4)To determine their optimal strategy, oligopolists must ________ to their strategy. D)both (A) and (B) are correct. 6)A(n) ________ industry has a single, unique product and blocked entry. 7) A few firms each large enough to influence market price characterizes the ________ market structure. 8) Which of the following is the best example of an oligopolistic industry? 9)Products may be homogeneous or differentiated in the ________ market structure. A) there is no price competition among oligopolistic firms. B) of the complex interdependence that usually exists among oligopolistic firms. C) price is NOT a decision variable for oligopolistic firms. D) there is price competition among oligopolistic firms but no competition on product quality. A) able to influence price only if the oligopolist's products are standardized. B) able to influence price only if the oligopolist's products are differentiated. C) able to influence price regardless of whether or not the product is differentiated or standardized by virtue of their size. D) unable to influence price regardless of whether or not the product is differentiated or standardized.